I’ve always had the sneaking impression that the more a brand spends on a famous face to front its fragrance, the less it actually believes in the fragrance itself – as though the actor’s aura, persona and profile were meant to supply personality to yet another designed-by-committee product. 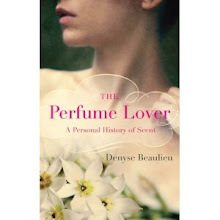 Only this time it’s the other way round: an actor seeking her identity through a fragrance, which she ended up fronting. The news came to me via the preview pages of the September issue of Vogue France – redesigned under Emmanuelle Alt’s stewardship, just as ousted editor Carine Roitfeld is launching her own CR Fashion Book. Isabelle Huppert, who will be the face for a limited edition of Fracas, may not be as well-known abroad as she is in France, where she is considered one of the very greatest French actors, bar none. She literally seems able to play anything; her scope extends from frothy comedies to avant-garde. Yet she is also gifted with the most amazing ability to retreat behind an invisibility cloak: I’ve seen her pass utterly unnoticed in public venues, including film and theater festivals, and several of my friends have confirmed this. If Huppert doesn’t want to be seen, she isn’t. With her exquisite sensitivity to the many nuances and complexities of what defines a persona, Huppert may feel much more keenly than most of us just what type of anchor a fragrance can provide. Does the outsized presence of Fracas partly answer her quest for definition? Perfumes are like purloined letters: their very invisibility tricks us into thinking their subliminal messages – the messages our subconscious sends to the world through its sillage – will remain hidden in full view. In joining the flamboyant Fracas sisterhood, Isabelle Huppert may be allowing the smoldering, venomous-innocent sexuality she lends to many of her characters to seep through and hover around her like an aura. It was after reading mentions of Fracas in a few of Isabelle Huppert’s interviews that Robert Piguet Parfums contacted her and asked her whether she wanted to collaborate in a limited edition, with a specially designed bottle. The most seductive aspect of this operation, to me, is that it lets me guess something of the secretive Huppert’s personality. For once, the actor-perfume pairing makes sense. Illustration: the portrait of Isabelle Huppert was taken by Myriam Roehri (click here for her website). Delurking because this actor-perfume pairing really surprises me! I've seen many of Huppert's films, love a few of them, and have always thought she would be the Chanel No. 19 kind of woman. Or anything that's aloof and dry and has iris in it. Or intellectual and offbeat, like a CDG. Even if one has to choose from the RP line, Bandit would be the one I'd figure is most her. But Fracas? Wow. Just goes to show this is one fascinating artist whose mystery deepens with every new facet she reveals. A saw a documentary about her and while she was being interviewed at a theatre, a bottle of L'Heure Bleue was resting on her vanity. Anonymous, it's quite possible that Huppert is not strictly faithful to Fracas, but yes, it's a very surprising choice! Though in a way I like it much better than something "consistent" with her image. 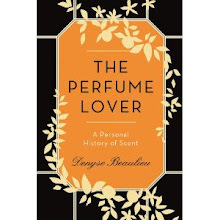 Whenever you encounter someone who's wearing the "wrong" perfume (in your view), you've got to wonder whether you're talking to the person you see, or to the secret persona you smell... Which is more genuine than the other? I'd say neither. "Genuineness" is as much of a construct as anything else. Cedric, maybe she was getting in character? L'Heure Bleue seems like the default choice of Frenchwomen between 40 and 60... And of course, there's no reason for Huppert to be any more faithful to one perfume than there is for any of us. Marla, in a way that's why I think the principle of "find a perfume suited to your personality" is much too limitative. As though we had just the one. Maybe people wearing a signature perfume are trying to get the whole bunch of those different personalities to play together? I must be the only person alive to not smell Fracas! I love Isabelle Hupert-I first saw her in Venus Beauty Institute, and adored her cracter in Villa Amelia. I wish her well, and wish French Vogue was sold here. It's a beautiful and provocative magazine. It will be interesting to see what post-Carine Vogue is like. Carole, about Fracas, I'm sure you're in very good company about not having smelled Fracas! It's worth seeking out though, if only to understand what all the fuss is about. Vogue France has bee headed by Emmanuelle Alt for a year now. I don't often buy glossy magazines (I stopped because I couldn't bear to throw them out and couldn't move around the house any more! ), but I'm looking forward to discovering the new look in the September issue. One of my favourite French actresses, and one of my favourite actresses full stop. I remember her so well in "La Dentiellère", she conveyed Pomme's fragility so well. `This is incredible, Huppert and Fracas. Fracas is really only for strong women, no matter what they look like, blonde, brunette. Huppert is such a great actor. I believe she is not very tall, and I think that helps pass unnoticed. When I worked in Harvard Square I saw Natalie Portman sometimes and no one paid attention - she's not tall. Anyway, I saw Alt mentioned in today's Wall St Journal as editor for French Vogue and I thought it was a mistake! Austenfan, I remember her in La Dentellière as well, but I must have been too immature when I first saw that film, or else the vulnerability of her character pushed too many buttons, because I took a real dislike to that movie! Which I guess is a proof of the strength of her composition. 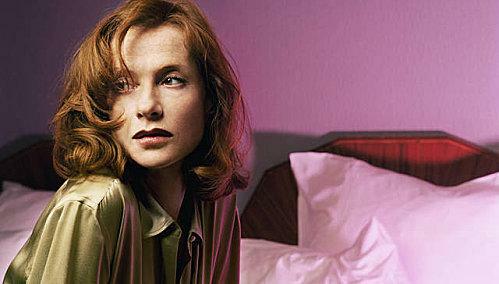 Huppert has gone on to be one of my favorite actresses as well -- how couldn't she be? She's one of the very best. Carla, Huppert is indeed diminutive -- I remember bumping into her in, of all places, the loo in a Parisian cinema running a restored copy of Visconti's Ludwig. She was so much shorter than me I almost didn't see her! As for Emmanuelle Alt, she's been helming Vogue France now for a year.